Modified Fee Payment Form - Gateway to Canada | Canada Immigration Consultancy! 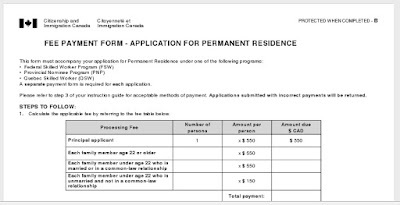 In connection with the changes to Provincial Nomination Program application process, Citizenship and Immigration Canada modief the Fee Payment Form - Application for Permanent Residence. So what's the consequence if you used the old form? The way things are going at Centralized Intake Office (CIO), it is not surprising if your application will be returned just because you used the old form. And I kid you not.